My study of Aikido started in 1996 having initially trained in Tae Kwon Do but wanted to change to an art that would develop my mind as well as my body. My first experience was in Gakko Ueshiba style which I thoroughly enjoyed, but work required me to move and I fortunately found a Ki Federation Club in Taunton & Bridgewater in 1998. Moving back to Wales I continued my study with the Ki Federation, primarily under Sensei Woolfall and for a time under Sensei Glyn and Val Smith. In 2009 I opened a club and then took over the Argoed Club which has now relocated to Maesycwmmer Community Centre. Sensei Mark Greenley started practicing Ki Aikido in 1981 when he joined the Plymouth and Torquay clubs in Devon. 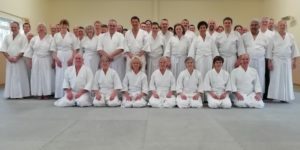 Over the next few years he attended many training courses under the direction of Sensei Ken Williams, head of the Ki Federation of Great Britain at the Federations headquarters in Somerset. In 1984 Mark passed his 1st Dan Black belt grading and in December of that year he moved to London. He continued training at several North London clubs and traveled back to Somerset on a regular basses to attend training courses at headquarters. In November 1985 Mark opened the Muswell Hill Ki Aikido club, this was in a small sports centre between Muswell Hill and Bounds Green. In January 1987 the club moved to Tetherdown Hall in Muswell Hill. In September 2017 the club re-located to the Baptise Church Hall Muswell Hill. In 2010 Mark was awarded 7th Dan. He is also a grading officer for the Ki Federation and continues to practice at at headquarters attending many training courses throughout the year. The club meets twice a week, and once a year invites a Ki Federation committee member to teach a one day area course. This is followed by a grading, and many teachers and students attend from around the country.